LIFE INSURANCE … WHO needs it? Take a look at the young people portrayed in the photographs above. Perhaps there is a face or an occupation you identify with. You may see yourself, or someone in your family, a co-worker or friend. 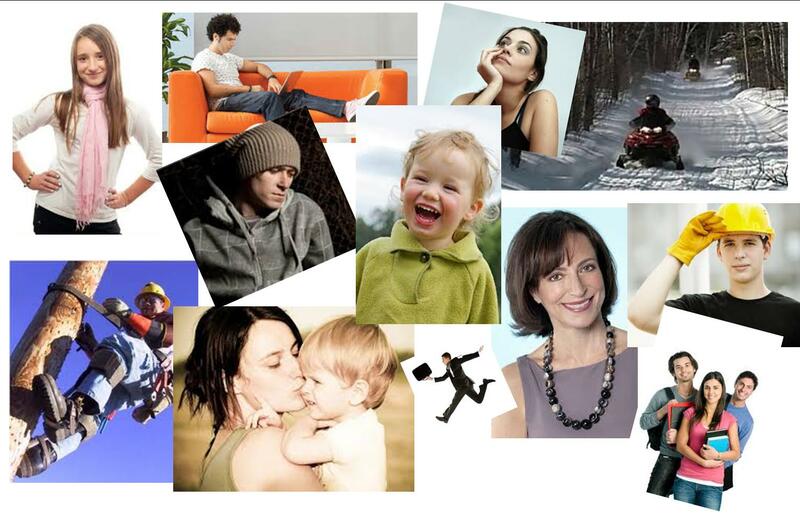 Who, of the above pictures, would need life insurance the most, and why? Instinct tells us that established adults, who have dependants and spouses that rely on their income for their lifestyle and care, may be the first choice for those that have a ‘need’ for life insurance. However, looking deeper into the choices, we start to see a few other stories that might provide some answer to the question of “Who Needs It”. Many feel that insurance for your children is merely a method of covering unforeseen expenses in the event of the death of a child, and feeling that can make us uncomfortable enough to not seek out this important step in their overall financial security. The benefit of securing insurance for your child or grandchild is that premiums are often very low and can remain low throughout their lives. It is a flexible asset that grows with them. The coverage may accumulate cash value on a tax-advantaged basis, that may be accessed in the future to help pay for education, or further down the road, a down payment for major assets such as a home or vehicle. Insurance for children is also important to lock in future insurability, as a childhood illness or injury may prevent coverage as an adult. In the event of premature death, the family will not have to worry about expenses, and may be able to use some funds to take time away to spend with family at life’s most difficult time. Insuring the child before age 16 reduces the need for medical underwriting, and possible higher premiums. Students entering post-secondary education for the most part have little or no income, and are accumulating debt rapidly as they progress through their education journey. A barrier then for this person to have life insurance would be purely financial. With no depend-ants, no home, and no assets to speak of, this young person may not be able to afford much in the way of coverage just now. Why do they need insurance? They may engage in activities that could affect their insurability in the future, such as lifestyle and leisure activities that could affect their health and wellness. Should they become ill, or have an accident, their insurability in the future may be affected. Locking in insurability while one is in good health is key to avoiding costly premiums or lack of insurability in the event something happens that is unforeseen or unexpected while they are enjoying this time of life. What does the student plan to do for his occupation in the future? Consider if the student graduates in a few years and is able to secure a great job shortly thereafter working as a…Linesman, construction worker, ski instructor, music producer….the list goes on. They may work in their chosen field for a short time. Some will be able to arrange group insurance coverage through work, and some may not. Some may have plans to stay with the company they forever, and some may have ten job changes throughout their lifetime. The type of work we do and the age at which we do it can affect premiums now and into the future. Graduates in their mid-twenties with new positions may not take the time or see the need for life insurance as they still are building their career and assets, not making room in the budget for coverage until a family comes along. They may be surprised to find, when they have left the ‘starter’ job and their group insurance coverage after five years, and are now in their 30s, exactly how much higher premiums will be at this new attained age. When the time has come for twenty somethings to transition into thirty somethings a shift in priorities can raise awareness about one’s full financial security plan that includes life insurance. Not only to replace income if a death should occur, coverage at this stage can be more expensive if there have been medical issues in the past. Take for example the young woman who experiences a serious car crash in her early 20s, and discovered that insurance premiums would be out of reach until at least 10 years had passed with no medical issues arising. Now in her 30s, the attained age alone will raise premiums. What kind of coverage suits the person in their 30s? It depends on both long and short-term needs. What some consider adequate coverage through group insurance plans with the employer may not, in fact, be enough as we age and begin to acquire further assets over time. Whether a family is in the plan or not at the time, if one comes along in the future, starting insurance later in life could mean much higher premiums and the need for underwriting. If a policy has been started early in life, perhaps a child policy, and there is a rider for future insurability without medical evidence, additional coverage may be offered to the policy owner, and the policy can be transferred from parent to adult child at any time. Questions: Talk to you financial security advisor today. These articles are for information purposes only and should not be construed as legal or tax advice. Every effort has been made to ensure accuracy, but law and interpretations may change, therefore errors and omissions are possible. All comments related to taxation are general in nature and are based on current Canadian tax legislation for Canadian residents, which is subject to change. For implications as they relate to individual circumstances, consult with legal or tax professionals. Click on this link to download your free copy of Adobe Reader to view the PDF documents on this page. September 2014: The exit strategy issue- when can you retire? August 2014: Saving for Education Issue: Why the RESP? July 2014: Who Gets The Cottage?